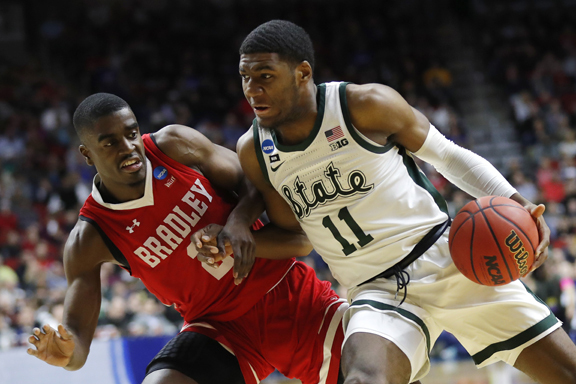 DES MOINES, Iowa — For about 35 minutes, it felt like Bradley might pull off the first bracket-busting stunner of this year’s NCAA Tournament. “Winston just wouldn’t let us lose,” Michigan State coach Tom Izzo said. Xavier Tillman had 16 points with 11 boards for the Spartans (29-6), who’ll face a Big Ten rival, 10th-seeded Minnesota, on Saturday in search of their first trip to the Sweet 16 in four years. Michigan State throttled the Gophers 79-55 in East Lansing back on Feb. 9. Bradley (20-15) gave the Big Ten champions all they could handle, though. It was a one-possession game until Matt McQuaid drilled a crucial 3 to put Michigan State ahead 61-55 with 3:31 left. Aaron Henry followed with a layup to cap a 9-0 run. Darrell Brown hit a 3 for Bradley to make it 65-60. But the Braves were forced to put the Spartans at the line — where they almost couldn’t miss. Bradley surged to a 35-34 halftime lead by shooting 6 of 9 from 3-point range. The Spartans made some of their own luck early in the second half, reeling off 10 straight points in less than two minutes to seize control. Bradley answered with eight straight of its own, though, to retake the lead, 51-50. Elijah Childs scored 19 points and Brown had 17 for the Braves, who went just 3 of 12 from beyond the arc in the second half. “I don’t think there were many teams that could have beat us today. We ran into one that could,” Bradley coach Brian Wardle said. Michigan State: Spartans fans no doubt had flashbacks to 2016, when Michigan State lost to 15th-seeded Middle Tennessee State. Michigan State epitomized the term “survive and advance” on a day when the shots just weren’t falling. The Spartans were just 5 of 19 on 3s. Bradley: The Braves posted back-to-back 20-win seasons for the first time in 10 years, won the Missouri Valley tournament for the first time in 31 years and terrified the Spartans for about 38 minutes. Regardless of Thursday’s result, this season will be remembered fondly in Peoria. The fiery Izzo was at it again for much of the game. He lit into Henry, a freshman, during a timeout, first running up to the guard as he came off the court and tapping him in the stomach while in a fit of rage. It continued during the huddle when he lunged at Henry and had to be settled down by other players. Saturday’s Minnesota-Michigan State matchup will be the earliest that two Big Ten teams have ever met in the NCAA Tournament. The only time that two Big Ten teams have played before the regional finals was in 1980, when Purdue beat Indiana in the Sweet 16. There hasn’t been an all-Big Ten matchup in any round since Michigan State beat Wisconsin in the Final Four in 2000. But it was tough to avoid such a scenario when the league sent a record eight teams to the tournament. “He does so much for this team the way he leads and controls the game. His passing ability and vision in addition to his scoring, he gets everybody on the court open. You’ve got to be ready for his passes,” McQuaid said about Winston.